Eldon Lavern Matheny was born September 3, 1934, on a farm near Plattville, Taylor County, Iowa the son of Claude Lavern Matheny and Crystal Dorothy (Evans) Matheny. The family later moved to Lenox where he attended school. After graduation, Eldon ran the Lenox Pool Hall and later worked for Hills, McCanna in Creston for 35 years. He was united in marriage to Ruth Walford and 3 children were born, Susan, Chester and Charles. In 1996, Ruth passed away. 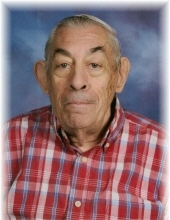 Eldon retired from Hills, McCanna and later worked as a custodian at the Lenox Public School for 10 years. In high school, Eldon enjoyed sports, playing basketball and running track. He supported Lenox sports and was a regular attendee at sporting activities. He enjoyed going to the casino and purchasing lottery tickets. Left to cherish Eldon’s memory is a son Charles Matheny and wife Brenda of Des Moines, Iowa; a daughter, Susan Weese and husband Bill of Gulf Breeze, Florida; three brothers, Harry Matheny of Blue Mound, Kansas; Gail Matheny of Lenox, Iowa; and Leonard Matheny and wife Judy, of Lenox, Iowa; a sister, Betty Joan Shimer and husband Dell of Creston, Iowa; four grandchildren, Trudi, Tim, Amber and Jamie; six great-grandchildren, Morgan, Aaron, Gracie, Harrison, Kenadi and Kayli; along with many other family members and friends. Preceding Eldon in death are his parents, Claude and Crystal Matheny; his wife Ruth Matheny; a son, Chester Matheny; and a sister, Louise. We will forever hold Eldon's memory in our hearts. May you be at peace in God’s loving care. The family will greet friends prior to the services. "Email Address" would like to share the life celebration of Eldon Lavern Matheny. Click on the "link" to go to share a favorite memory or leave a condolence message for the family.